Although the sign on LaTisha Williams' desk reads, "Solutions Please," it could just as easily say, "Find Encouragement Here." With a ready smile that radiates warmth, Williams is always quick to serve and to praise others, with a personality that draws colleagues, employees and friends toward her. Williams has many experiences of everyday encouragement to share in her 10 years with the Architect of the Capitol (AOC), currently as custodial worker supervisor in the House Office Buildings Day Cleaning division and previously with Senate Office Buildings. True to her nature, when asked to speak about her own volunteer work, she talks instead of her AOC colleagues and how they regularly support her, each other and their customers. She then launches into a story about her fellow AOC employees who took a pause from their shoveling work to help some pedestrians cross a particularly icy stretch of pavement this winter. "I have been so grateful to the people who work here. We are all here to help each other," Williams said, gesturing to her coworkers who were gathered for lunch at a table outside of her office. "We have taken a personal interest in each other and have real community here." 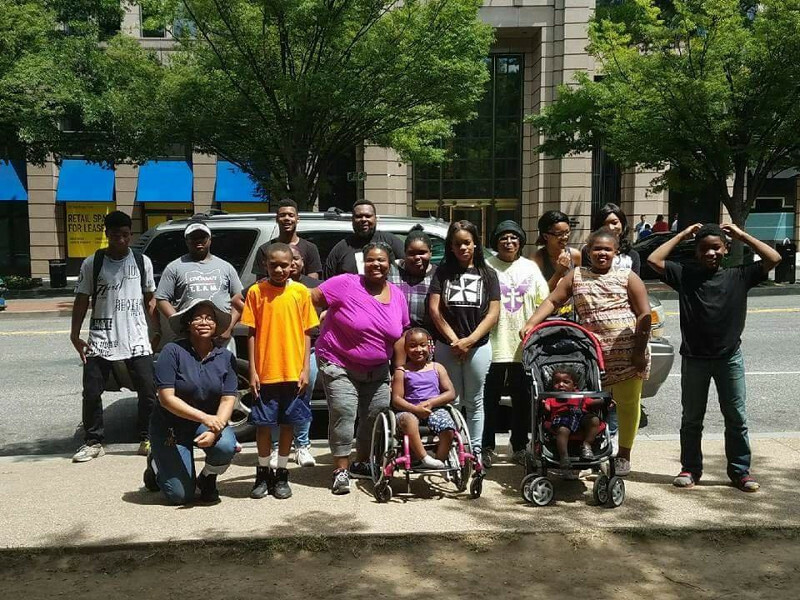 Group photo from a volunteer opportunity Williams was a part of. Connecting with her community is important to her, whether at work or at home. Williams is always asking the people she interacts with throughout the day about their lives. What she has discovered is that many people just need someone to listen to them. "Our life experiences are not just for us to go through and get through, but to share them with others," said Williams. "Help somebody else dealing with the same thing." Her affection for the employees she supervises is evident when she talks about them, in addition to her pride in their work in the Cannon and Longworth House Office Buildings. Williams encourages them to apply for other open jobs at the AOC because she wants all of her employees to have the chance to move up and do the work they want to do. She helps them prepare their applications and is so proud to see her employees also helping each other. Williams tries to share an encouraging word with each of her employees every day because, "Some people do not get an encouraging word at home. I hope after I've uplifted somebody, that they will be nice to somebody else." "LaTisha has a passion for people," said Cordell Shields, laborer (recycler) general supervisor, who nominated Williams for the Architect's Award for Community Service that she received in 2017. "She has great people skills and really cares for her employees. She assists the laborers and custodians doing their jobs sometimes so she can better understand what they need and what they may come to her about." 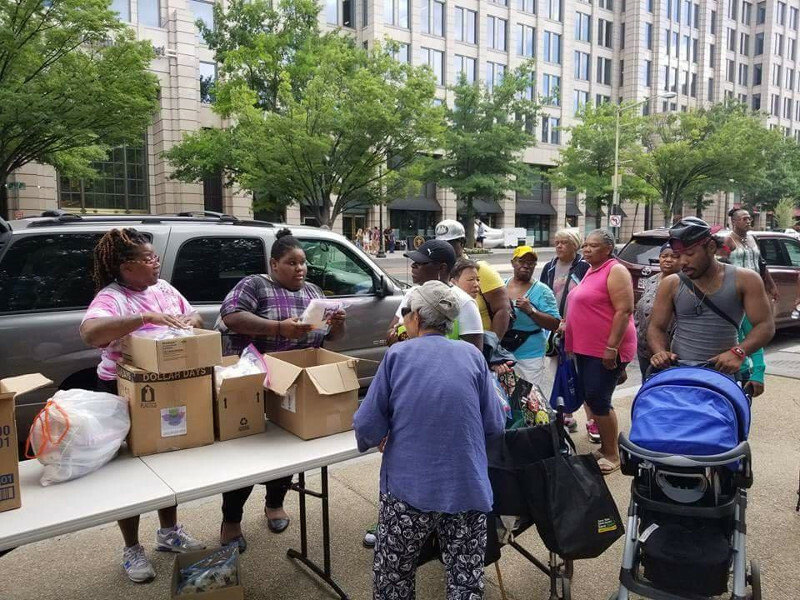 Williams was part of a team that distributed coats, scarves, gloves and toiletries to the homeless in Franklin Park in downtown Washington, D.C.
Outside of work, she is a member of a church that she describes as, "small, but very mighty," with a focus on giving. She serves in the community through her church by participating in food and clothing drives, helping the elderly, and supporting local homeless shelters. Williams passes this passion for serving her community onto her children Arrielle (18), Christopher (16) and Chase (11). 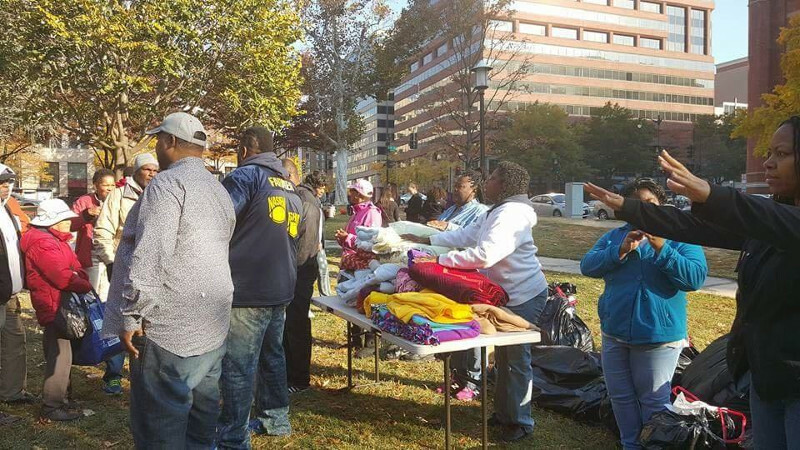 Together, they recently collected and distributed coats, scarves, gloves and toiletries to homeless people in Franklin Park in downtown Washington, D.C. They also provided food baskets to families who could use some extra support during the holiday season. "You just never know who may need you or what you can offer someone else," said Williams. "I used to have so much pride thinking I had it all together. Then you have some humbling experiences that make you realize that you don't. We need each other." Williams also volunteers with her son Christopher for the Civil Air Patrol, which is an auxiliary of the U.S. Air Force. The organization teaches kids survival skills and prepares them for service in the U.S. Air Force. As a member and active participant, she chaperones many activities, such as the annual wreath laying at Arlington Cemetery during the holiday season and serving lunch to members of the military on local bases. More team members distributing coats, scarves, gloves and toiletries. While caring for those in our communities is a reward unto itself, she recognizes the lessons it teaches her children. "You never know how much you are going to bless someone when you help them, and it shows them how truly blessed they are," said Williams. "We don't always know what is happening in someone else's life." Spending time with Williams brings to light the importance of connection, encouragement and service. To explain how she has time for all of her volunteer work in addition to a full workload and her family, she admits she needs to slow down a bit and care for herself to preserve her health. Then without much of a pause, she starts talking about the new women's fellowship she will lead at her church. It doesn't sound like Williams will be slowing down any time soon.